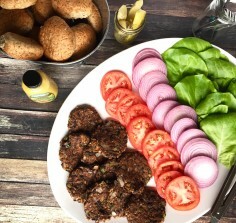 This vegan burger pairs protein-rich black beans with flavorful veggies to create a batch of gluten-free patties. Make once and save the leftovers for a quick microwave meal. In a skillet over medium heat, sauté oil, onions, garlic, poblano pepper, carrots and taco seasoning for 8 minutes, until vegetables are tender and most of the water is released. Transfer mixture to mixing bowl and blot with a paper towel to remove excess moisture. Stir in refried beans, black beans and chip crumbs. If mix is too wet, add more chip crumbs. Form mixture into 10 patties. Brush patties with grapeseed oil and brown each side in a skillet for about 4 minutes. Serve immediately or refrigerate in airtight container for up to 5 days. Note: This recipe can be made in advance. Simply form mixture into patties, cook/brown and freeze. Looks awesome! How do these freeze? I think my 1 year old would love these and need to have something premade for those crazy weeknight dinners, as I don’t want to purchase the processed veggie burgers in the grocery stores. Too much crap in them, despite the attractive quality of being easy! Hey Andrea! Just cook them & when they are cool -wrap them in freezer wrap individually. You can warm them using the microwave, grill, broiler or pan on the stovetop. hey Susan! I’m so glad you like the Weekly Nutrition WOW newsletter. Speedy, interesting & useful is what I am going for! You’ll love the burgers! I made these last week and they were so delicious! They really do make 10 patties. I shamelessly ate 5 that very same day for lunch and dinner. YUM! Even my carnivorous hubby loved them! Made these tonight for my sisters, one of whom is a vegetarian dnd the other gluten-free. We all LOVED them! So easy to make, they will become a staple in my recipe rotation! I’m so glad you & your sisters loved them! YUM! I am getting older and eating better and wiser! So I Love trying new healthier recipes and ideas! I will be trying alot of these recipes, Because they are all so simple! Good Work Dawn, Please Keep Them Coming! Hi! I am having a hard time getting these to stay together when I make them. They break apart every time when I try to cook them. Any suggestions?! Veggie Burger Troubleshooting: 1) Make sure the veggies are cut super, super small, if the pieces are too big, they will cause the burger to crumble. 2) Let the burgers mix set & sit for 15 minutes in the fridge before making patties so everything has a chance to stick together. 3) Use your HANDS to pack the burgers, make sure to squish/squeeze the mix while you are forming the patties, don’t be afraid to really get in there!